Visitors to the University of Louisiana at Lafayette campus are always welcome. An hourly parking lot designated for visitors on the UL Lafayette campus is located at the new Girard Park Circle Parking Garage located on Girard Park Circle. Levels one and two are the designated visitor parking levels for this garage. The lot on the side of the Student Union is designated as complimentary 30 minute parking for visitors. Parking is restricted to 30 minutes per occurrence in this lot. 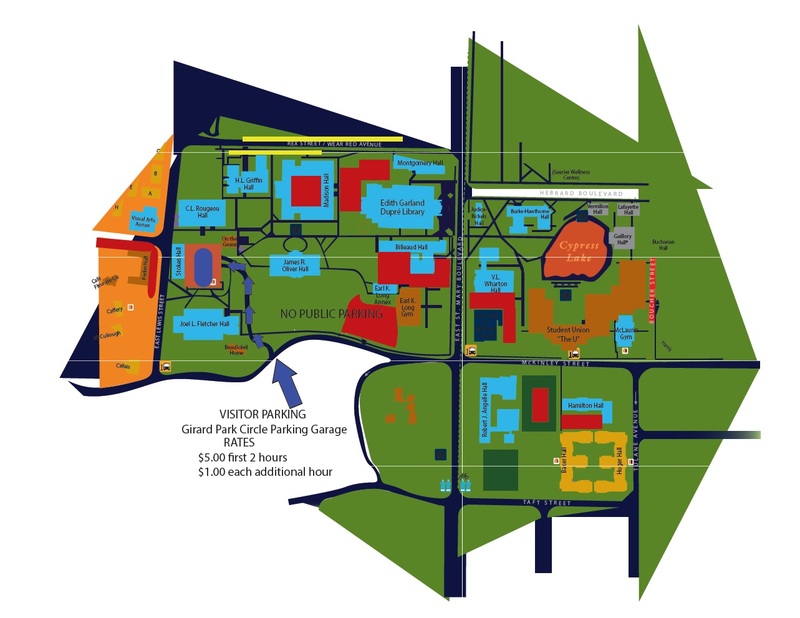 University affiliates who park on campus are required to purchase a permit, therefore, we ask visitors to refrain from parking in areas designated for faculty, staff and students, unless prior arrangements are made through Transportation Services. Violators are subject to ticketing and/or towing. Faculty, staff and students are responsible for any citations that are issued to visiting family members. If parking is not available in one of these areas or if special arrangements are needed, please call Transportation Services at 337.482.6858. Monday - Thursday 7:30 a.m. to 10 p.m.
Only debit or credit cards are accepted and are paid at one of the conveniently located pay stations in the corners of the parking garage on levels one and two. Cash or checks are not accepted at the pay stations. Guests should park in an hourly visitor parking area. Those fees will not be waived or validated by Transportation Services. Less chance of parking fines. Reminders are sent by text message to your cellular phone – just enter your phone number when you pay with a credit card. Extend your parking time from any location prior to time expiring! After parking, go to the nearest pay station to pay for your parking using a credit card. When prompted, enter your mobile number to receive a text message reminder prior to expiry. Reply to the text message prior to time expiring with the amount of additional minutes using 60 minute increments. This amount will be charged to the card you used for payment at the machine. Vendors must call the Office of Transportation Services to get a temporary permit.